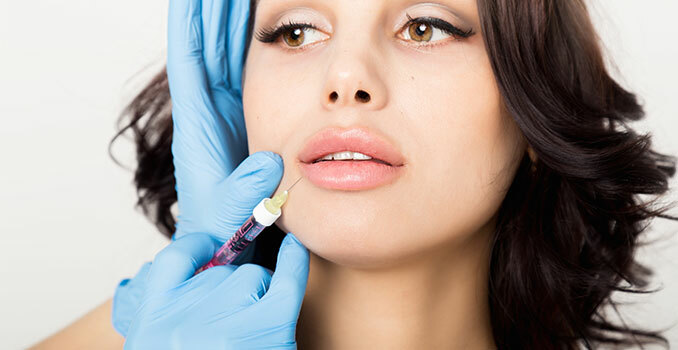 Dermal fillers are an injectable treatment that helps to restore the volume and fullness of the face. This treatment can help diminish signs of aging, such as wrinkles, fine lines, thinner lips, and shallow contours. Your face can look fuller and more youthful! Fillers work by filling the spaces in the face that have lost volume. This treatment is injected into different areas of the face to plump up and fill out wrinkles, depressions, and signs of aging. Unlike Botox, dermal fillers are used to fill and restore areas of the face rather than reduce the muscle movement to avoid wrinkles. There are two types of dermal fillers—naturally-derived and synthetic. At Azeal Dermatology Institute, we offer naturally-derived dermal fillers, including Juvederm® and Restylane®. Both of these filler brands use hyaluronic acid, which is a natural substance found in the body. This acid is found in soft connective tissue and skin tissue and is often used to help ease pain in aching joints. If you are unhappy with crow’s feet, marionette lines, worry lines, smile lines, or other depressions that are giving your face an aged appearance, fillers could be just what you need. Dermal fillers can help to improve the appearance of these facial depressions and lines, adding volume to your face. This could help you look younger and soften the appearance of wrinkles. Learn about the different types of dermal fillers the Azeal Dermatology offers. Contact us today and we can help you decide which dermal fillers will be best for your needs and wants. Give your face a youthful and fuller look with fillers!